APB users are faced with a choice: Listen to the occasional advert on the game's voice chat, or pay a small fee to remove them. Earlier today, posters on the forums for crime MMOG APB noticed a button on the accounts page which gave players to pay a small fee to remove VOIP ads for periods of 30, 90 and 180 days. This seemed to be first that the APB community had heard about the ads, and was obviously a source of some concern. A few hours later, a community officer for Realtime Worlds posted on the forums and outlined exactly the extent of the advertising. Players will only hear an ad when then enter a new zone, and then only once every three hours, even if the player changes zones during that period. The community officer seemed to imply that the ads, and the charge to remove them, were because the VOIP was being provided by third party Vivox. Reactions to the news have been mixed. Some have accepted is as a fairly minor intrusion, while others feel that in-game advertising in a game that carries a monthly fee is unacceptable, regardless of how unobtrusive it is. Others are upset that this was kept secret until so close to the game's launch, as many have already pre-ordered it. 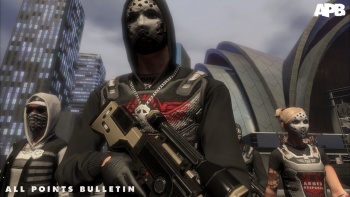 APB is released on June 29th in North America, July 1st in Europe, and July 2nd in the UK.